Today, approximately one in 25 Americans is morbidly obese and many deal with weight-related health conditions such as hypertension, Type 2 diabetes, heart disease, sleep apnea and/or high cholesterol. In addition, there may be psychological consequences such as lowered self-esteem, anxiety and depression. For the majority of the morbidly obese, diet and exercise may not lead to significant, continuous weight loss. Fortunately, bariatric surgery may provide a better alternative. 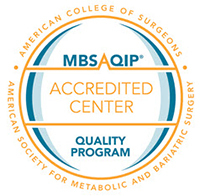 Our Center for Surgical Weight Loss is a Bariatric Surgery Center of Excellence with Blue Distinction certification, and provides supportive, understanding and compassionate care for the unique needs of obese individuals. Orbera is a non-surgical outpatient procedure where the physician inserts a deflated intragastric balloon into the stomach and then inflates the balloon. The balloon creates the feeling of being full and both slows and reduces the consumption of food. After six months the balloon is deflated and the person should continue the behavior of healthy eating habits. Once your Body Mass Index (BMI) has been determined, surgical and non-surgical weight loss choices will be discussed. Typically, people with a Body Mass Index (BMI) of 35 or greater to consider weight loss surgery, and those with a BMI of 30-40 may consider a non-surgical option. Only your physician can appropriately determine the best choice with you. Learn yours by using this BMI Calculator. The decision to have bariatric surgery should not be taken lightly. Our team is here for you to address any questions or concerns you may have. You are also invited to attend a free information session or our monthly support group meetings to learn more about weight loss choices. View the calendar below for class times and locations. Call (256) 265-4373 for more information.